Pattern Drafting Experience at the Grafton Academy, Dublin. Back in November I took a notion and rang the Grafton Academy to find out how their evening / part time classes worked. I always had a dream of attending to learn the secrets of pattern design and to get some professional sewing classes. I was either broke (when I was a young student) or no time (ever since!!). After speaking to the lovely people at the Grafton Academy and getting help with the kids school pick ups and drop offs I signed up for a course of 12 classes. I decided to do two classes on a wednesday to save on travelling time etc. My tutor was Anne and I really enjoyed every class. I have also met other budding designers and dressmakers and learned loads. It was quite intensive and to get the most from it I felt I had to do a fair bit of homework. I already had made the skirt, dress and trouser block last summer with Tiina so I had an idea how that worked. We started by drafting a new bodice/dress block and I was stunned to find that it was almost a perfect fit on the first attempt. 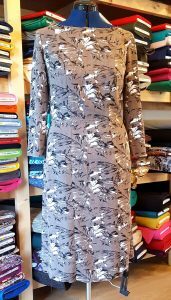 I started this dress over the christmas break – it’s a princess seam dress in a linen/viscose mix fabric and lined with a gorgeous taupe satin. I made the pattern from my dress block however it’s still a work in progress because I have been distracted by lots of other things but it may be time to get it finished and wear it. The second week, Anne decided to challenge me by drafting a jacket block and collar. We drafted the main body of the jacket from my bodice block with a few adjustments and then Anne performed a few magic tricks to make the collar and facing. I was totally perplexed. I went home and had a few weeks off as the college was closed for Christmas and worked on making a calico of the jacket. 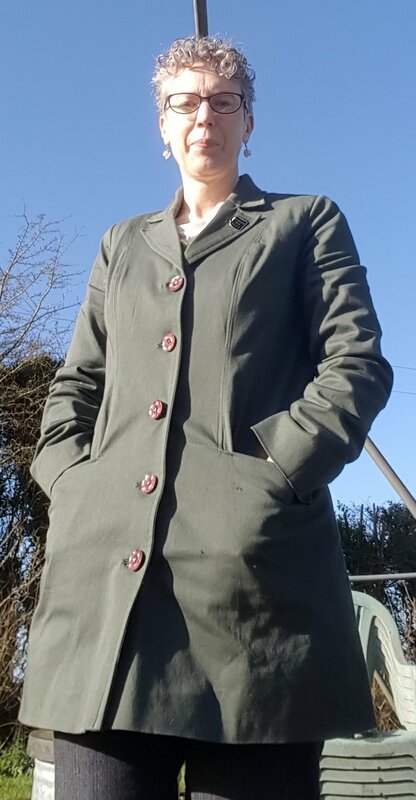 First muslin – I didn’t like the big collar for this jacket – maybe in a nice wool for next winter! It turned out much too big and I didn’t like the collar much. When I returned in January we redrafted the jacket block and got it to fit perfectly. Then we had another go at drafting a new collar and facing and luckily I could follow the process a lot better the second time around. I went home after the third day with a pattern for my jacket, so now came the tough decision of which fabrics to pick. As you all know I have a large fabric supply aka Dress Fabrics shop!! 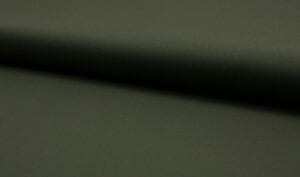 I hummed and hawed and eventually settled on this Khaki Cotton Twill. I ordered it in a few months ago when I was making my Kelly Anorak. 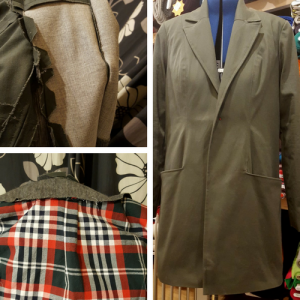 I had great plans to make a few Kelly jackets in different colours. Those plans are on hold – I’m still thinking I’d like a navy hooded one using this Navy twill. I wanted to use a lining that would be a bit warmer than regular poly lining so there was only one that fit the bill and was a perfect colour match. This is a lovely soft and warm brushed cotton. It added a good layer of warmth to the jacket. I used this normal lining in the sleeves for ease of use. Lining up the jacket pieces. I started to assemble the jacket, first up was to interface strategic areas as instructed by Anne. 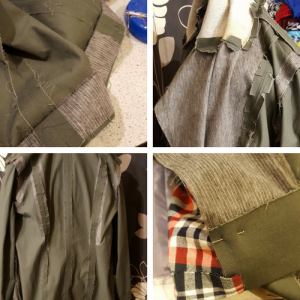 Used two different types of interfacing for this jacket. I used two different interfacings – neither are your bog standard iron on vilene! I discovered hair canvas – which is a stiff fusible interfacing and I used that in the collar. 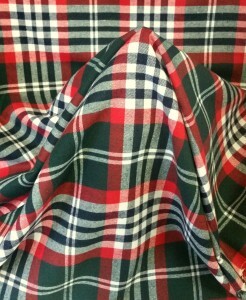 The other is a woven interfacing used for coats, jackets – it has lines on it. 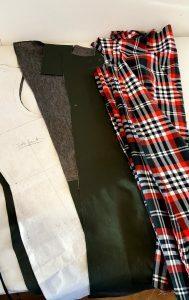 I purchased both in the school but I now have a roll of the woven interfacing in the shop since I hope to make lots more coats and jackets in the future. I interfaced the collar, the princess seams, most of the front of the jacket and along the hem turns. Here is a good tutorial on coat construction if you want to read up on this technique a bit more. Sewing up the coat and attaching the lining was simple enough – just follow any pattern instruction on that but the collar was where I had most issues. I had to give it a few attempts and the ripper was used. I got there in the end with Anne’s help but it’s still not 100% even – not even 90%. I top stitched around the edge of the collar and down along the front edges. I was told then I could have finished my seams a little better ie rolled the seams behind. Next one will be better!! I also topstitched along the princess seams to give it a bit of definition – one of the other students suggested that and I’m glad I took her advice. Here I am wearing it with buttons and all. Anne gave me a great tip – to make the button holes with two spools of thread – like if you were using a twin needle but thread both strands through the single needle. This was a eureka moment for me – I have since used it to top stitch a pair of jeans and love how it turns out. Much better than faffing about with topstitch thread and tension etc. 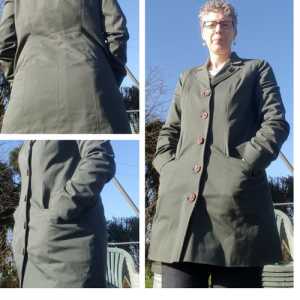 I love how this jacket fits me in the back – this is the reason I sew and I am learning about pattern drafting. It has a centre back seam and princess seam. We have concluded that a centre back seam is the best option for me in most garments due to my shape and I am ok with that. 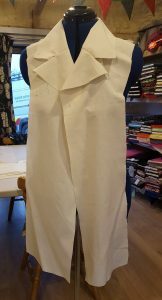 In the front the design lines follow a princess seam from the armhole to the top of the pocket and then go at a slight slant to the side seam. There was a bit of engineering to get the corner of the pocket to lie flat but it’s all a learning curve. It was worth it to have those big pockets to stick my hands into and still big enough to fit phones, wallet and hankies! I love my jacket – I’ve worn it a lot. Its a good weight for our climate – just warm enough for most of our mild winter and cool spring. I have signed up to do another block of classes in May – June in the Grafton Academy. I cannot wait, I’d like to do a bit more work on my jacket block, draft a few different collar options and maybe a shirt. Its taken me 3 months to finish this blog post hopefully the next one won’t take so long! !